It just seems like I can’t do anything right. When something goes good something else starts to spiral down. Tired of being let down. Tired of making people seem better than they are. Love is thrown around like confetti; people don’t care they use love like any other word. We break our own hearts for people we think we “love” who don’t love us back. The person you thought you were going to have forever become strangers. 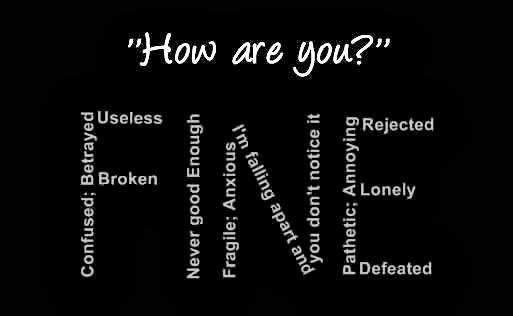 It’s usually easy to pretend to be happy; you just put a smile on your face and say you’re fine. Easy to pretend to be okay. Pretend it doesn’t bother you when really it’s all you can think about. It seems like we have all gotten pretty good at pretending. We hold onto memories because they are the only thing that doesn’t change when the people inside of them are completely different now. I’m not suicidal; I’m just not happy. I feel like I have so much to do but can’t do it. I just don’t know how I feel. Sure there are times when I’m not not happy but it doesn’t last long. But it’s okay, I’m okay, it’ll be okay. They say things get better, so I’m just looking forward to that.